I can’t tell you how dangerous it is for me to go into Trader Joe’s. I know it’s definitely a love/hate place for folks, but I have found some sinfully yummy things that just can’t be beaten in taste and price from other places. Plus, it’s really my only splurge in the pre-packaged food area. We do eat pretty healthily, but it’s nice to indulge in laziness every once in a while. 0% Fat Greek Yogurt: tastes just like Fage, comes in yummy pomegranate and blueberry, and 1/2 the price. Chicken Tikka Masala: It’s kind of hard to believe this is frozen. The only Indian that I’ve have (pre-made) that resembles… um, Indian. 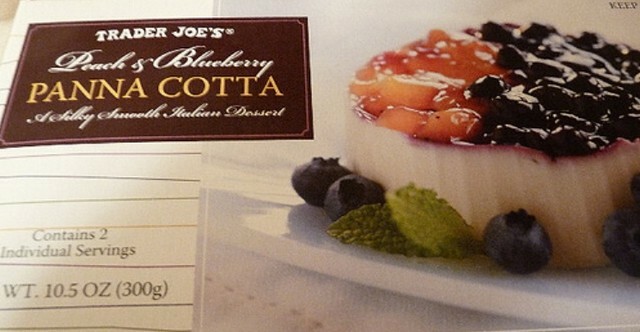 Blueberry & Peach Panna Cotta: I kind of wish I never found this because it’s so damn dangerous. I’ve had plenty of panna cotta from high-falutin’ restaurants in my day, and this one certainly beats some of the best. And all you have to do is defrost. I know. Go get like 12 now. Highbrow Chocolate Chip Cookies: Finally a cookie in a box that makes it pointless for me to bake. Seriously buttery, salty, sweet yumminess. RCTJWF (varies) & Reggiano Lambrusco wines (+ the infamous Two-Buck Chuck in Shiraz). The one saving grace about Trader Joe’s is that its reasonable inexpensive. Otherwise, we’d be broke. I love that place. You are currently reading The Trader Joe’s Whore at mingaling.